is the Holy Grail of sustainable fashion. You aren’t imagining it: clothes have changed, and what has happened is a whodunit where the stakes are very, very high. A funny thing started to happen about 15 years ago. Maybe you noticed it only when you went to take a new shirt out of its maiden voyage in the washer and discovered the hem had unraveled. Or maybe the lifetime of your jeans began to shorten perceptibly. First, you found yourself at the store for a replacement pair, a bit sooner than you might have expected. Then you were there again less than a year later. Then you’re there with the new pair ripped across the knees, less than 2 months after you bought them, embarrassed but also confused. Are you imagining it, or was this different before? I remember acutely the moment in 2010 when I put on a pair of what looked like black brogues and discovered they were nothing but a kind of vinyl sac with a rubber pad for a sole. They aren’t shoes, I realized with a chill, looking around the sleek glass box of a Manhattan store. They just look like them. And no wonder. For $20 you can’t buy shoes, not really. You’re buying a facsimile designed to get you out the door and back again in a couple of weeks, when brogues are out of style and ballet flats are in. You aren’t imagining it: clothes have changed, and what has happened is a whodunit where the stakes are very, very high. In the 1950s, Americans spent a whopping ten percent of their income on clothes. These garments were relatively expensive, compared to what we expect now, but they also lasted longer. When people had to choose a new skirt or suit for the office, they might not be able to afford another one for quite some time. In fact, as journalist Elizabeth Cline wrote in her 2012 book Overdressed: The Shockingly High Cost of Cheap Fashion, for much of the twentieth century, many people often did not buy clothes more than a few times a year. Even until relatively recently—as late as the 1980s—new clothes were usually occasional purchases. Labor has always been the most expensive part of clothing, and an irreducible one at that: It is actually impossible to mechanize a seamstress, beyond giving her a sewing machine. “Because clothing is so labor-intensive, the price of labor directly affects the retail price of clothes,” says Cline, who has continued to cover the social and environmental impact of modern fashion. Fast-fashion companies such as Zara and H&M make their money by shortening the time between trends and encouraging customers to buy inexpensive clothes that, in many cases, appear to be made to last no longer than the lifetime of the fad. Currently, H&M alone makes between 550 and 600 million items of clothing a year. And thanks to the fact that most clothes today are made by people working for low wages, developed-world consumers have never spent so little on their wardrobes. It might surprise you to learn that Americans now buy at least one item of clothing a week. Run this clock forward over the years, however, and you start to see a problem (beyond the humanitarian one—companies continue to use factories like the one in which more than 1,000 workers died in a building collapse in Bangladesh in 2013). Already, says Cline, “global clothing consumption has doubled in the past 15 years.” The industry, driven by fast fashion, has steadily become one of the most serious polluters in the world. Clothing manufacture was never exactly tidy, what with toxic dyes, copious amounts of water needed for growing fiber and processing fabrics, and waste from factories. But in 2015, carbon emissions from clothes surpassed those emitted from all international flights and all maritime shipping combined. Cotton, for example, uses more pesticides than any other crop—and organic cotton takes up more land and much more water than conventionally grown cotton. At the same time, clothes are worn for less time than they ever have been previously. Every year, 12.7 million tons of textiles enter American landfills; in 2015 in the UK, 300,000 tons of clothes went in, about ten pounds per person. Giving old clothes to charity isn’t the charitable act you might think it is—many of the clothes made today are of such poor quality that they cannot be sold again. You might not think of yourself as the kind of person who cares much about clothes. I know I didn’t. As someone who has always felt like a brain inconveniently hampered by a body, I can’t say I ever thought much about them—except to wonder why, as an averagely shaped human being, I found it so hard to find things that fit. But even if you don’t spend much time thinking about fashion, this concerns you. 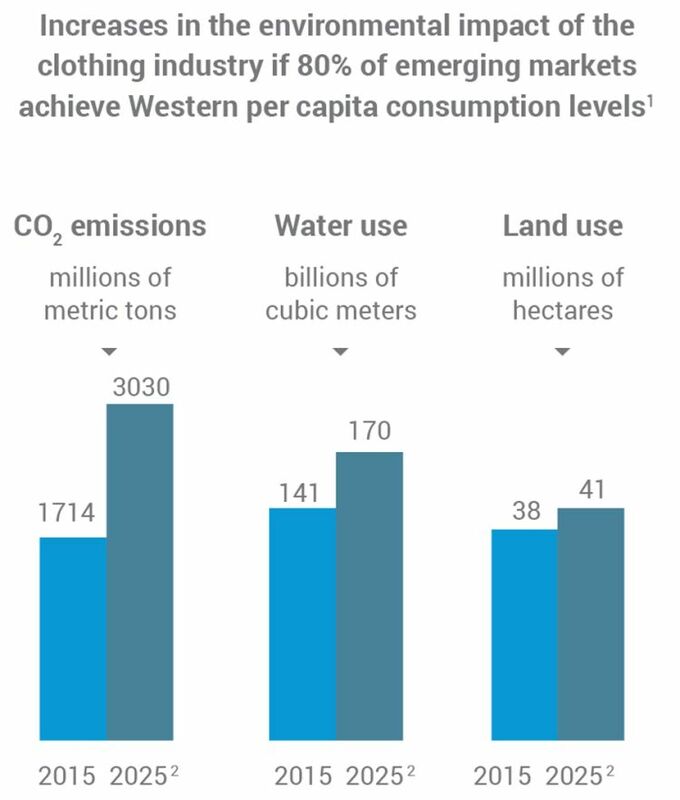 Carbon emissions from clothes surpassed those emitted from all international flights and maritime shipping combined. Clothing is a thorny industry to get your mind around, because it’s agriculture, mining, light industry, fun, necessity, and luxury all rolled into one. The fibers that go into a shirt usually begin as something grown in a field, such as cotton, or something extracted from the earth, such as polyester. They must be processed at mills to make thread, then fabric; they are dyed along the way, using petrochemicals, and are treated with other substances. The cut fabric is pieced together at sewing machines; trims and buttons, each with their own industrial footprint, make their appearance; and the final product may be treated again to give it a certain texture or quality. There’s a lot going on here. One angle on saving ourselves from our clothes comes from economizing in the mills and factories. On this front, one of the most striking efforts has come from Clean by Design, a program run by the Natural Resources Defense Council. Mills in China that make fabrics for brands in the US and elsewhere commit to picking what Linda Greer, senior scientist in the NRDC’s health program, calls the “low-hanging fruit” of sustainability. Dyeing a single ton of fabric can take 200 tons of water and enormous quantities of energy. Mills that join the Clean by Design program commit to insulating pipes; using waste heat to heat water; installing meters to monitor electricity, steam, and water usage; and other measures drawn from a list of ten basic best practices to bring down their impact as well as their operating cost. Many of the improvements have a quick return on investment, usually recouping costs within a year. The changes seem very straightforward and simple, but they’re miles ahead of where these mills were before. Out of an estimated 15,000 in China, about 150 mills have gone the Clean by Design process, and an additional 60 or so in Italy have joined as well. Between 2014 and 2017, the project prevented the use of 70 million tons of water and 90,000 tons of coal. Clean By Design is now transitioning from the NRDC to the Sustainable Apparel Coalition, an industry-funded group, in order to accelerate the process of converting mills. Furthermore, in an effort to create more transparency, the NRDC and the Institute of Public and Environmental Affairs released in January of this year a map where consumers can check the pollution records of suppliers for Gap, Target, New Balance, Esprit, PUMA, and Inditex (the parent company of Zara). Brands provide the identities of their suppliers—factories, mills, and so on—and the map reports the facilities’ numbers, collected by automatic sensors, in real time. In practice, the maps are difficult to use and the readouts can be glitchy—but it’s a start to bringing in accountability. Greer and colleagues have also begun designing science-based targets for the fashion industry in order to control carbon emissions; she expects to release blueprints this summer. Another opportunity to save resources comes when the fabric has been made and all the pieces come together. To highlight this, Redress, a Hong Kong NGO focused on reducing waste in fashion, runs an annual competition in which 30 or so emerging designers produce collections using waste from the clothing-making process. Although consumers never see that waste, it can be substantial: the leftover fabric from millions of little black dresses and trendy spring tops grows into mountains of garbage. At the same time, designers learn from industry insiders how to make sustainable design choices—choosing a mill that minimizes its environmental impact, for example, and selecting a fabric that can be recycled when the clothing has reached the end of its life. Designers have control over roughly 80 percent of the environmental impact of clothing manufacturing, says Redress founder Christina Dean, in that they can make decisions that influence a garment’s entire lifetime. Still, efficiency—though important—will not solve the problem of clothing in the garbage. The most efficient and environmentally friendly process, if it runs 24 hours a day making objects that go nearly immediately into the landfill, is not sustainable. Several years ago, Tasha Lewis, a professor of fiber sciences at Cornell University, found herself in Haiti surrounded by first-world cast-offs. 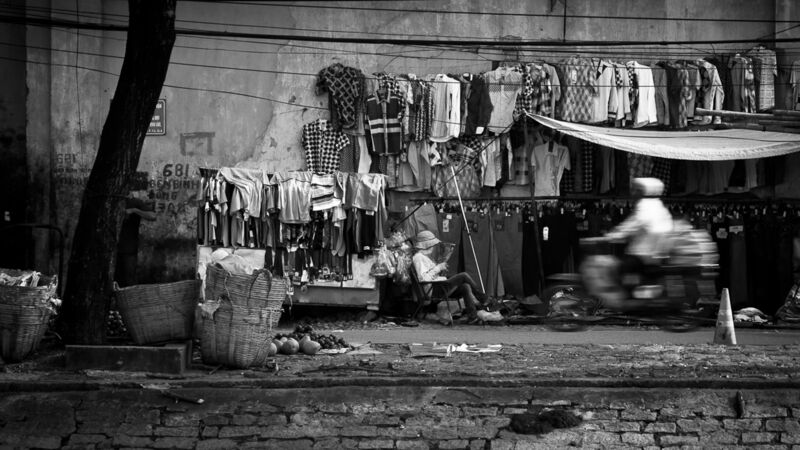 Some were donations that came in as aid, while others came in through the extensive second-hand-clothes market—whereby the discards of the developed world are shipped hundreds or thousands of miles to be sold in the developing world. Increasingly, these used clothes cannot find even a second-hand market, thanks to differing tastes or poor quality. The energy that goes into making finished garments is so significant, however, that even if they avoid the landfill by becoming rags, it’s a wasted opportunity. And so Lewis, her students, and the founders of a Toronto clothing start-up called Local Buttons picked through those cast-offs, sifting out the climatically inappropriate wool suits and the sizes and styles unlikely to sell in Haiti—and made new clothes out of them. As they worked, using software to snapshot the pieces of old garments and then carefully designing new bodices, skirt panels, and other items out of that footprint, they discovered numerous signs of the manufacturers’ lack of foresight about a garment’s life cycle. For instance, Lewis had hoped to avoid having to take apart every single seam by hand, instead using a solvent to dissolve the threads efficiently. But the threads are often blended—meaning they include both polyester and cotton. “So we can’t make a solvent to dissolve the thread and not destroy the garment,” Lewis says. Designing clothes so they are easy to take apart and reassemble isn’t on the industry’s radar screen. Lewis wonders how different things would be if a company had a legal responsibility to plan for the end of its product’s lifetime. “If you had to take it back, how would you design it?” she asks. Lewis recounts a recent trip to New York, where she met scientists working on fibers spun from food waste. Even though such projects are in the comparatively early stages of development, many have moved past the whimsical phase of stunts and art projects. One company in the San Francisco Bay Area, Mango Materials, has been working for eight years on commercializing a process in which bacteria convert methane into a biodegradable plastic; last summer, the company found a way to spin the substance into polyester-like fibers that can be used in clothes. These methane-munching bacteria, which naturally make a plastic polymer to use in their own cell walls, are given methane that otherwise would be considered waste. One of the company’s current methane providers is a Bay Area wastewater-treatment facility, says company founder Molly Morse. Although Mango Materials has focused mainly on using the plastic they extract from the bacteria for making biodegradable packaging—the polymers will break down when exposed to heat, acid, or soil bacteria—Morse says that from the beginning, the interest from textile companies has been intense. When the company happened on a method for generating fibers and brought it to clothing makers, it was met with great excitement. 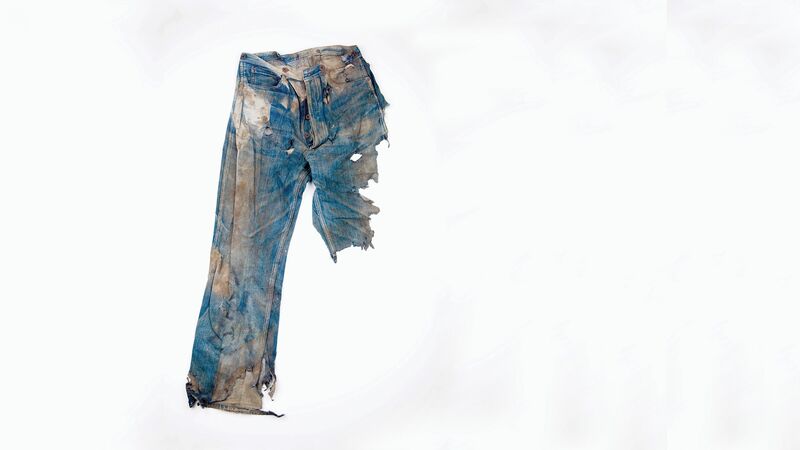 Such clothes could degrade naturally in a landfill but could also be recycled to produce new fibers. Morse hopes that within the next year or two, a small number of garments made this way will be released, to gauge the public’s response. But these solutions are still coming up to scale. Turning back to the question of whether this is enough, the answer is still no. If we’re going to save ourselves, the problem of volume—the sheer, immense, improbable volume of clothes pouring out of factories every single day of every single year—needs to be met head-on. Kate Fletcher, a professor of sustainability, fashion, and design at the University of the Arts in London, posted a manifesto of sorts on her blog last fall. In it, she spoke against the idea that simply consuming smarter, rather than consuming radically less, could ever be the solution to the problem of fashion. “There have been some really impressive gains in terms of efficiency delivery within the sector over the last decade,” she said on the phone recently. “I would say, hand on heart, that every single garment produced now is better in pure resource-efficiency terms today than it was a decade ago.” But the volume, she says, is “outstripping any benefits” gained from improvements in efficiency. Even if companies don’t want to slow down—if there is nothing forcing them to slow down—we as consumers must. To start with, on the most basic level, we must stop throwing away clothes, churning through disposable dresses and pants that are worn only once. And that’s hard to do if we don’t—let’s be honest—particularly care about them. Every single garment produced now is better in pure resource efficiency terms today than it was a decade ago. But the volume is outstripping any benefits gained from improvements in efficiency. Historically, I have a bad relationship with clothes. After many years in New York City, Switzerland, and other bastions of the well dressed, I moved to China, to a city at the pulsing heart of the world’s textile industry. When I began frequenting a street-market stall—where I dug through enormous heaps of ludicrously ugly garments while the proprietress, a thin woman from Sichuan Province, hollered, “You’re too fat! They’re all too small for you!”—it didn’t really feel like much of a departure from normal. If anything, it was refreshingly honest. The shop where I tried on those laughable excuses for shoes years ago, when fast fashion was younger and more innocent, didn’t have the guts to say what was on its mind. It was hard to imagine love entering into the picture. Elizabeth Cline feels, however, that when done right, owning clothes does involve a great deal of emotion. “What does it mean to create a functioning wardrobe you can get a lot of use out of?” she asks. This is a vastly important question for the future of sustainable fashion. Rather than focusing solely on buying clothes made ethically or with less waste, we should focus on transforming what we have into things that we actually want to wear for years into the future. Repairing clothes that develop holes or lose buttons is a simple first step to take. Numerous studies have found that even very simple mending skills have fallen out of practice, and that many people today could not sew on a button or darn a sock. These skills are worth learning, not just because it’s satisfying to bring a beloved sweater back out of retirement, but because they can increase the number of times clothing is worn before being discarded. Presently, many items are worn only seven to ten times before being tossed, and the average person keeps clothing for half as long as they did 15 years ago. Companies such as Patagonia, who ask you to have a jacket repaired for free rather than throwing it away, are on the right track, says Cline. Even if only a portion of our belongings gets this treatment, from professionals or from ourselves, it would make a difference. Along those lines, getting a garment custom-made sounds like insanity to most of us, the kind of conspicuous consumption that’s totally out of reach. But many of us, though not all, do in fact shell out for high-end or hand-made products: a top-of-the-line laptop, local eggs, a good mattress. Why not, in light of the devastation wreaked by heedless production of a sub-par product, clothes? The idea is to build a garment that fits you like a glove and that you purchase instead of impulse-buying ten lesser ones. Cline says that if a new custom garment seems improbable right now, consider asking a local seamstress or tailor how much it would cost to alter a find from a thrift store so that it fits you well. It may be surprisingly inexpensive. Reining in consumption by buying better quality and keeping it for longer can cost more money upfront. But unlike buying organic food, say, it is within the reach of almost anyone with a mind for a good deal and the patience to repair. Organic milk will be consumed just as quickly as conventional milk, but it’s not an option for everyone: many budgets cannot accommodate a more expensive product that lasts exactly as long as a cheaper one. Clothes, however, last a very, very, long time, even though many people forget that. If you a buy good-quality wool skirt at a thrift store for five dollars, you could pass it on to your granddaughter. Doing clothes right takes planning, some resources, and some ingenuity, and it isn’t always simple. Still, it can be worth it. After two years of making do with the handful of clothes I’d brought from the US—ironically, many of them made in China or Bangladesh—I had run out of options. I did mend things. But holes opened up next to them as the cheap fabric unraveled. It was stupid: I needed to look like a reasonable human being, and my clothes—to which I had always paid little or no attention—were getting in the way. Riding a wave of irritation, I went into the fabric market across the street from my home. I found a stall selling a striking brocade unlike anything I had ever seen, a rich blue woven with a scene of mountains above a lake. I bought three meters of it. I took it to a woman who made me first a dress, then a coat. It was more affordable than it would have been in the US, but still more than I had ever spent on any item of clothing before. And it wasn’t nearly as easy as buying something off the rack. There were arguments with the tailor, a last-minute restructuring of the coat collar, time ticking away. But the coat! I described it to Cline: how for the first time in my life, a coat fit my shoulders as well as my waist. It also—and this was something that shocked me—covered my wrists. I had gotten so used to half-exposed wrists and to thinking of myself as someone who crept around in a shapeless down sack, that wearing this new thing was a revelation. I can throw it on with no preparation and look not just reasonable, but actually good. It feels like something I could keep for a long, long time. Veronique Greenwood’s work has appeared in the Atlantic, the New York Times Magazine, Scientific American, and Discover.